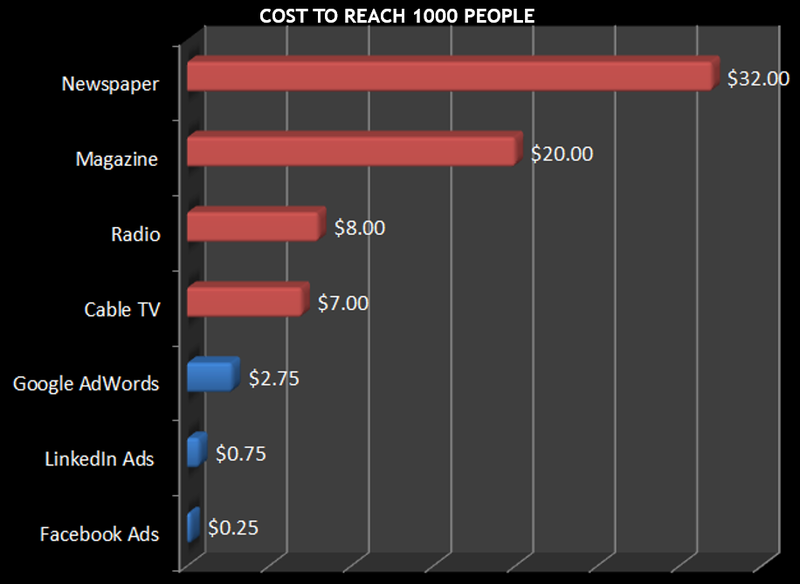 How much does Facebook advertising cost? This is a common question for companies and marketers who are just getting started with it. And unfortunately, there really is no cookie cutter, one-size-fits-all answer. The results speak for themselves, with an ROI you won’t come close to with traditional media. Facebook Ads will never cost you more than you can afford, thanks to budget settings that can’t be exceeded without your input. When trying to figure out your Facebook advertising cost, you’ll need to take into account several factors. But first, it’s necessary to understand how the Facebook ad system works. Much like Google Adwords, Facebook uses an algorithm to determine how to show your ads and even which ads actually get shown. The main difference between these two digital paid ads platforms is that Facebook Ads costs much less when compared to similar Google Adwords campaigns. They can also be targeted much more specifically to a desired audience. Help advertisers reach and get results from their target audiences. Once an order has been placed, Facebook holds an “auction” for ads vying for space and attention. Money is not a large factor in deciding who ends up taking a coveted ad spot. This is both to be fair to those with small budgets, and to provide only the most relevant content to Facebook’s users. The auction also helps to serve the purpose of managing relatively little space against many bidders. The advertiser bid is how much you’re willing to pay for ads. Facebook uses this to determine how interested you are in showing your ad. Bids can be set manually or automatically, depending on your understanding of the Facebook advertising platform. If you choose to bid automatically, Facebook decides the bid amount with the goal of using up your designated budget to get the best results. With manual bidding, you determine what you’re willing to pay per ad placement. Don’t bid too low. Otherwise your ad may not get the exposure it deserves. Ultimately, you get what you pay for. When you bid high, Facebook won’t necessarily use that total amount. It will still get the lowest amount possible for the auction, relative to the next highest bid. This is similar to how Google Adwords works. Ad quality and relevance refers to the perceived level of interest people have when they see your ad. Facebook ranks ads based on their relevancy scores, which can be viewed through the Facebook Ads Manager. Interactions such as clicks and playbacks can contribute to a higher score. Facebook bases the estimated action rate on your target audience, who have previously completed actions (likes, clicks, views) related to your ad or to similar companies, as well as your ad’s previous performance. So, if the estimated action rate is low, Facebook will compensate by increasing ad cost accordingly. Ultimately, the highest total score on these combined factors gets the most favorable placement and pricing. Audience targeting refers to how many people you are trying to reach. You can target Facebook Ads according to age, gender, connections, interests and behaviors. Combining one or many of these subfactors can help you narrow in on very specific audiences. Some audience targets come with a higher price tag than others. For example, some countries (like the US) are more expensive to target than others. Depending on the situation, timing can have a great affect on Facebook advertising cost. Peak shopping seasons or holidays have advertisers flocking to buy ads, so Facebook has to increase costs according to the economic laws of supply and demand. With that in mind, be ready for higher ad prices at Christmas, New Year’s Day and Eve, Thanksgiving, Black Friday, Cyber Monday and during post holiday sales. There are multiple options for ad placement, and the corresponding Facebook advertising cost reflects each placement’s noted ability to get attention and convert. Facebook recommends including ad placements on Instagram and the Audience Network in order to fully optimize your ad spend. With both of these enabled, Facebook says you’ll be able to reach a larger audience at a lower cost. If your ad isn’t optimized for your specific type of result, Facebook might not show your ad to people who are most likely to act on it. You might end up paying more for the results. If you just want website clicks, optimize for click links—and nothing else. Diluting an ad’s purpose with too many calls to action or incongruent calls-to-action (when compared with the rest of the ad) will negatively affect your campaign. Facebook helps you with ad delivery optimization by showing it to people who they think will likely take action based on your specific call to action. In order to reach your goals, conversions are necessary. To increase your conversions, it’s helpful to get your ad in front of people who have demonstrated a clear interest in other similar ads. Facebook offers multiple payment structures. Each has an effect on Facebook advertising cost and the effectiveness of your ads. When you choose CPC, you only pay when users click on your ads. With this pricing model, they don’t have to convert or purchase—just click. On that note, users who simply view an ad don’t count towards what you end up paying, which means exposure is essentially free (though not a measurable conversion action). In a study of over $100 million spending on Facebook in 2016 Q4, data from AdEspresso showed how prices vary by country. Cost per click was highest in Australia, Japan and Norway, which fell in the range of $0.69-0.73. 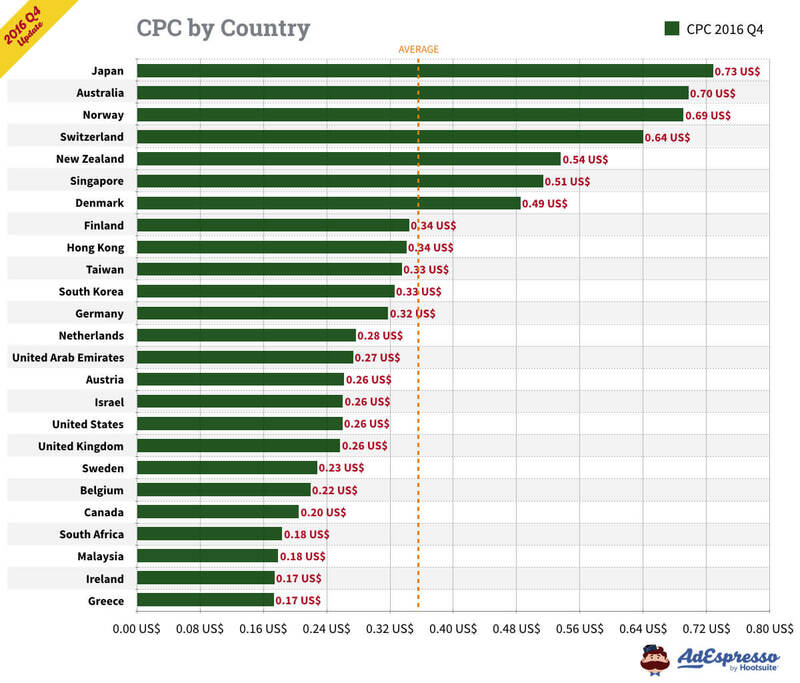 The lowest cost per click was found for Ireland and Greece at $0.18. The average cost per click was $0.35 globally, and $0.28 for the US. Looking through the study, you can glean additional data related to different types of targeting and ad delivery, including gender, age, placement and campaign objectives. The day and time of day that ads run can also contribute to cost. To give an example, Mondays are the cheapest days to run Facebook Ads. 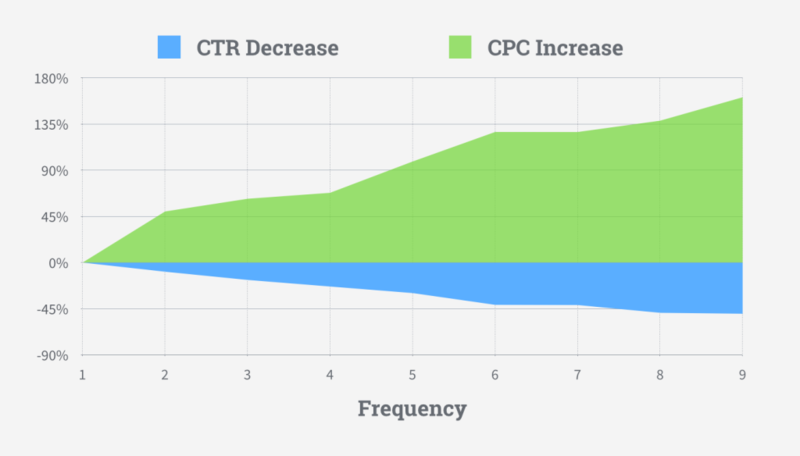 To use CPC, you’ll want to choose the optimization option: clicks to your ad/site. This payment option is fairly straightforward, and involves paying for every like you get on your page from your ad. The highest CPL in 2016 was from Germany ($0.40), US was at $0.20, and the average hangs around $0.27. Audience targeting can play a major role in cost per like, so choose your audience wisely. When you choose CPM as your payment type, it refers to the rate you pay for every 1000 views of your ad. 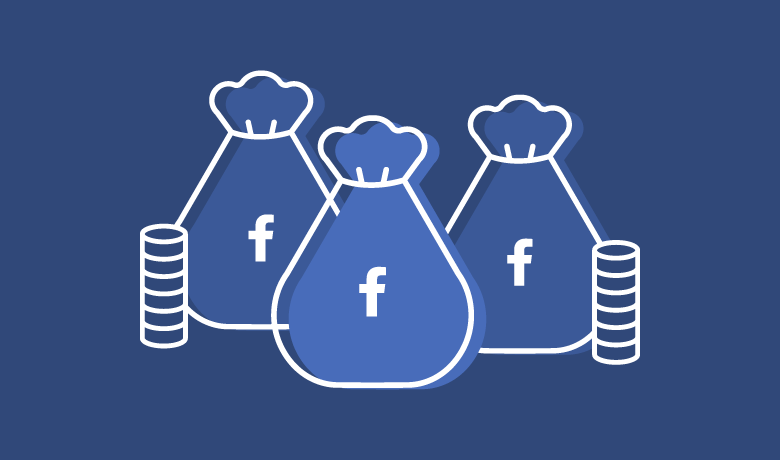 This Facebook advertising cost tends to be lower than a CPC payment structure, and is the ideal structure for when you’re looking to build brand awareness and want more people to see your ads. Conversions: Facebook delivers the ad to those who are most likely convert. Impressions: Facebook gets your ads as many views as possible for your budget. Daily unique reach: Facebook delivers your ads to people up to once per day during the campaign. When you use CPA to pay for Facebook Ads, you are paying for a specific action and subsequently, conversion. This method costs more than clicks, but brings with it a higher ROI. For example, for app installs, UK and Germany have the highest costs at $5.40 and $3.18, respectively, while Brazil has the lowest at $0.44. The average is at around $1.67. It costs less for older people to like/interact/install. The reach objective is the most expensive. CPC costs less for everything but page engagement. Next, consider your current Facebook presence. It will be easier to create conversions if you already have a larger, engaged Facebook audience. Building a community is better in the long run than trying to appeal to one time fans that may eventually unlike your page. Also, consider your niche. Boring, super technical niches may have a harder time getting conversions than fun, entertainment-driven niches that produce super shareable content. Ultimately, the best way to set a budget comes from testing and refining ads, then extrapolating results to build a budget based on your findings. Though it can be helpful to know industry benchmarks, the biggest successes when it comes to reducing your Facebook advertising cost will come as the result of continuous tests and improvements. First, split testing helps reduce costs by determining what works on your ads and what does not. You might spend a chunk of your advertising budget on ad A, only to find out that it was ad B that converted better with your target audience. Luckily, Facebook offers built-in split testingfunctionality, which tests at two levels: audiences and delivery optimization. The higher the frequency, the less interactions, and the less conversions. AdSpresso looked at the correlation between Facebook Ad frequency and costs. They found that as frequency grows, CTRs decrease and CPC increases. So as a general rule, if your frequency is greater than three, stop the ad. On that note, consistently keep your ads fresh and updated. Even the best ads run out of steam. Add new images, craft new copy, then test your results with split testing. Another major factor affecting your Facebook advertising cost? The audience you’re targeting. The more specific, the better. It is better to run more ads to smaller groups than to be running a few ads to a large audience. Even though some audiences can be more expensive than others, when smaller targeted audiences click on the ad (especially those that are familiar with your brand), it could mean more engagement and conversions. This ultimately leads to a lower overall Facebook Ads cost and a higher ROI. When planning an ad campaign, focus on one objective. A fatal flaw of many campaigns is trying to ask their audience to take too many actions at once. It is confusing and your audiences will think it is too much work. Instead, create multiple ads with one focus. By having a single focus, you’re making it easier for audiences to make a decision, and as a result, convert. Finally, choosing relevant images could help lower ad costs. Most businesses use Facebook carousel ads, which allow them to use more than one image. Facebook carousel ads have higher conversion rates that increase the relevance score and lower cost. The main takeaway? If the ad is targeted to a specific audience, it is likely to be more relevant, causing the audience to interact and convert. This lowers the cost and increases the ROI. That said, costs can vary thanks to a wide variety of factors: seasonality (and possibly competition), area of placement or the target audience/geographic location of said audience.